It’s the end of the UK’s Fairtrade Fortnight 2017. We have been working with our Fairtrade friends to promote the importance of having a break at work. 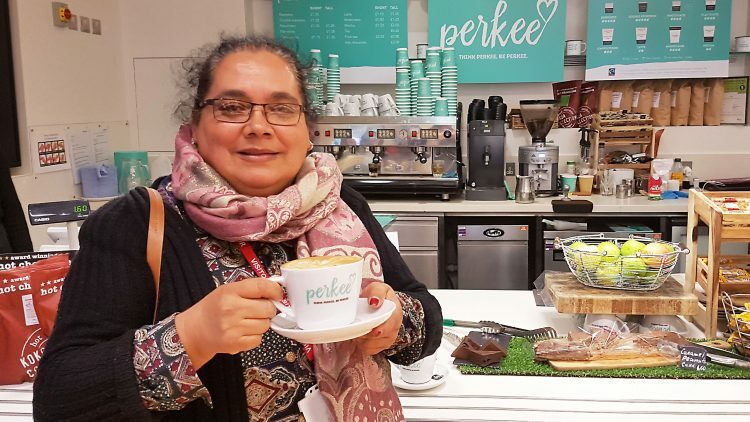 Fairtrade Fortnight break stations have ‘popped-up’ in our cafes to educate and refuel our customers. We even had an extra special ‘pop-in’ to a break time in North London restaurant from a Soppexcca Fairtrade Farmer, Maura Jarquin. Having a break provides lots of positives: healthier bodies, healthier minds, time to think, sustained energy levels and ultimately an enhanced performance at work. bartlett mitchell facilitates this by offering a range of healthy and ethical snacks and drinks including Perkee coffee. However, many farmers who grow the food and drink that we eat and drink don’t earn enough to feed their own families. By choosing to put Fairtrade in their break times, our customers have helped farmers earn enough to provide for themselves. This also ensures that workers on farms are treated fairly by requiring that they can take the breaks they need. We are living in uncertain times. Following the vote for Brexit, the UK will need to renegotiate more than 50 international trade deals. No one knows yet what this will mean for farmers and workers in poor countries. At the same time, there are supermarket price wars and exchange rate fluctuations which combined put even more pressure on the most vulnerable producers who grow much of what we eat. It’s more crucial than ever that farmers and workers are considered – we mustn’t undo the Fairtrade progress made in the last twenty years or put farmers in a perilous position. That’s why we have been so keen to tell customers the real stories about how farmers and their families in cooperatives like Soppexcca in Nicaragua benefit from Fairtrade. Soppexcca grows the coffee beans that we roast to create Perkee coffee. The cooperative’s profits are ploughed back in to pay for education, health centres and alternative businesses to diversify. I think we all recognise the little green and turquoise Fairtrade symbol, but how many of us know that Fairtrade is about far more than just fair prices? Fairtrade has two unique mechanisms that ensure it is good for farmers; the Fairtrade Minimum Price and Fairtrade Premium. Fairtrade offers a safety net to farmers; in 2016, international coffee prices often did not cover the costs of production, and were below Fairtrade’s Minimum Price, meaning that Fairtrade farmers had some protection from this price volatility (they will always get the market price if higher). On top of sales, farmers also receive the additional Fairtrade Premium to invest in business or community improvements. A whole range of environmental criteria are covered within Fairtrade standards, for example, environmental management, pest management, soil and water management, waste, GMO, biodiversity, GHG emissions. Additionally, these standards are developmental. Therefore, over the first six years of certification, Fairtrade farmers need to continue to improve upon their practices and reach more ambitious levels to be re-certified the following year. 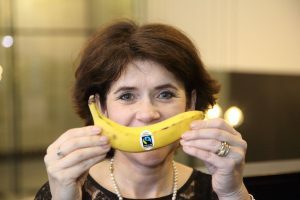 We need more people to buy more Fairtrade food and drink, the good news is that nearly half of industry leaders believe ethical purchasing is more important to consumers than it was even last year. However, history shows that ethical purchasing fluctuates with prevalent social and economic concerns. Beyond Fairtrade Fortnight, look out for the symbol and where you see an opportunity, swap to Fairtrade and improve the lives of farmers and their families.